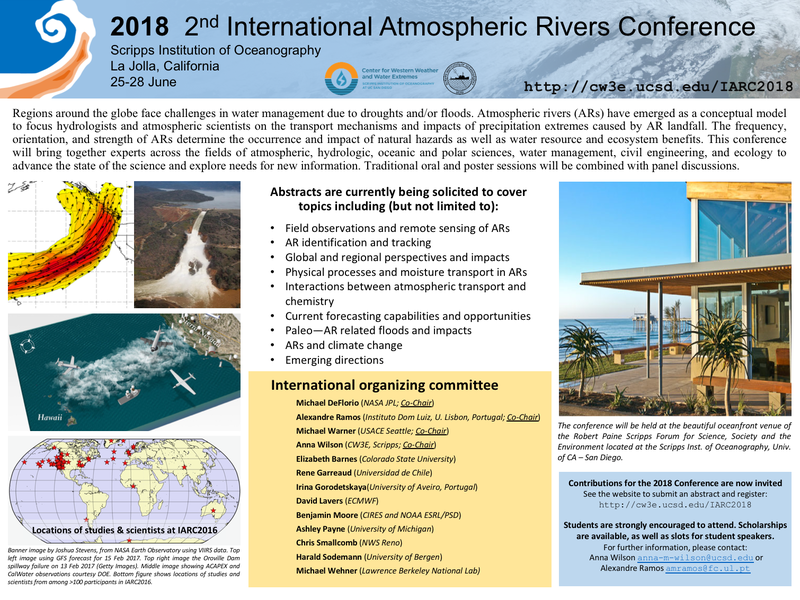 Synopsis: The 2018 International Atmospheric Rivers Conference will convene on Monday 25 June 2018 in the beautiful Seaside Forum at the Scripps Institution of Oceanography in La Jolla, California. Four full days of poster and oral presentations will cover global regional perspectives on atmospheric river science including associated and parallel processes. Suggested Accomodation: Hotel La Jolla is holding a select block of rooms at a special conference rate of $229 per night. This hotel is within a comfortable walking distance to the Forum and provides complimentary on-request shuttle service. The special rate is available starting Sunday, June 24, 2018, and lasts through Wednesday, June 27, 2018. You must book before May 25, 2018, to obtain the special conference rate. Please click here to learn more about the hotel. The booking code is IARC18 and can be used by entering the code into the “Group Code” field under “More Options”. Bookings can also be made by phone at 1-800-HILTONS and by referencing the “SIO IARC 2018 Room Block” and the pertinent dates. If you qualify for government rates or have further questions please contact Tyler Garcia, Catering and Events Manager at Hotel La Jolla, directly. You can e-mail Tyler: Tyler.Garcia@hotellajolla.com. If you need accomodation beyond the conference dates Tyler can work with you. CLick here for a list of San Diego Hotels that offer government rates.